Maybe if I had hours to use up, and no books to read, gardens to tend, class work to do (or mindless crime dramas to watch) I would think about double-digging. But time is just too precious for that sort of thing … in my humble opinion. I take the lazy woman’s approach. 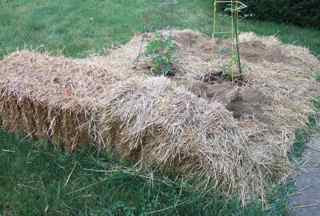 I define the edges of a bed and lay down cardboard, and on top of that straw. And I wait. The worms take it from there, savoring the rotting lawn and tolerating the cardboard. Or maybe savoring that too—what do I know about the tastes of worms? In a month or three (depending on the season) the bed is diggable. But I am wondering whether the worms will find my garden in this recently-acquired property. Why worry, you might ask? Last week a paving contractor widened my driveway, removing in the process about 8 inches of topsoil. “I can take this away for you,” he offered. “No way!” I replied. So he piled it up and I transported it around a corner and planted viburnums, and coneflowers, and roses. It should have been good topsoil, and it was, sort of. But something was missing. There were no worms. There were no clumps (technically, peds) held together by worm poop and fungi (technically, glomalin). There was no visible life at all. It fell apart like sand. Easy to dig, yes … in fact troublingly so. This is what happens when you spread pesticides to kill grubs, pre-emergent herbicides to kill crabgrass seedlings, and broadleaf killers to kill dandelions, as the previous owner did. Ok so the lawn is enviable. But the robins that flocked to the bare soil came up distressingly empty-beaked. I am inoculating all of my planting holes with compost. If I cared about the fate of my lawn, which will suffer from withdrawal now that its steady supply of drugs is about to run out, I would have someone come aerate it. Then I would replace the little lifeless soil plugs left lying about like crumbling turds with compost filled with springtails and beetles, protozoa and nematodes. And earthworms. But (being predisposed to the lazy woman’s approach) I am instead placing my trust in migration. Earthworms migrate slowly—about 15 to 20 feet a year—so this will take time. I will just have to make, and inoculate, lots and lots of planting holes. That I have time for!